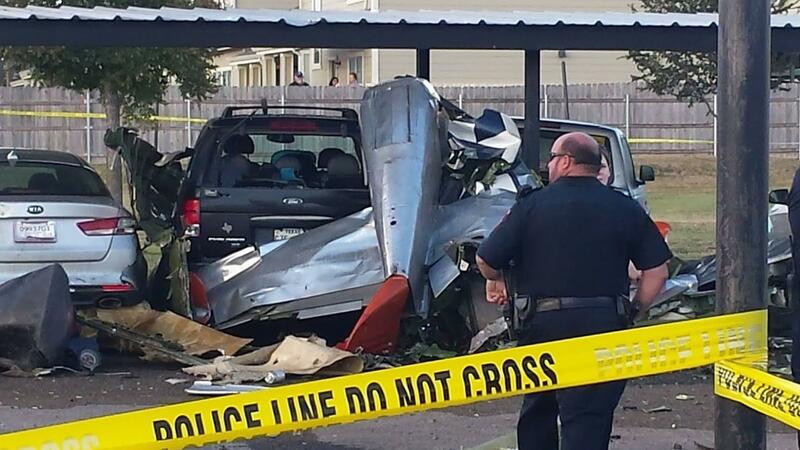 FREDERICKSBURG, Texas -- A privately-owned vintage World War II Mustang fighter airplane that had participated in a flyover for a museum event crashed into the parking lot of a Texas apartment complex Saturday, killing the pilot and a passenger, authorities said. One of the victims was a veteran, the Pacific War Museum told CBS Austin affiliate KEYE. Texas Department of Public Safety Sgt. Orlando Moreno confirmed the two people on board had died in the crash in Fredericksburg, about 70 miles north of San Antonio, but he did not identify them. The P-51D Mustang fighter was returning after performing a flyover during a living history show at the National Museum of the Pacific War, museum director Rorie Cartier told The Associated Press in an email. Fredericksburg is home to the museum.